What is a Probate and are they Required? California Probate is a legal proceeding required to settle a deceased person's estate, paying all debts of the decedent, and distributing the property to the heirs and beneficiaries. .A court probate of a will, depending on the size of the estate, can be expensive and time-consuming. Is a Probate Required in the State of California? But for estates in California that exceed the small estate's threshold, and for which there is either no Will, or a Will (but not a Living Trust), probate will be required before an estate can be transferred to the decedent's heirs or beneficiaries. Please give me a call (408)505-6144. I specialize in the sale of residential properties for the past 30 (+) years that are in Probate. Clients, Friends & Family, please join me for the San Jose Veterans Day Parade, on Saturday, November 11th. It is one of the largest and most entertaining venues in the country. Please feel free to Google Veterans Council of San Jose for a preview. This year I will be in charge of the grandstand where VIP’s will be seated. The festivities will begin at 11:00am and will end at approximately 12:30pm. The grandstand is located right in front of The Hilton Hotel, Downtown San Jose. Market Street will be closed. I recommend you park at the high rise lot on Park Avenue where the restaurant Scott’s Seafood is located. Walk a half block to Market Street and please look for me. Please email me at mikethegreek@earthlink.net if you are planning on attending so that I can reserve a seat for you and your family. Have a reflective and positive Veterans Day Weekend, Hope to see you there! 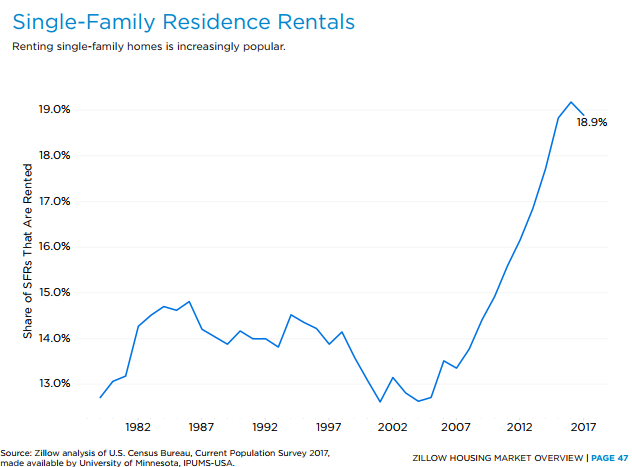 There has been a massive trend towards renting. The vast majority of household growth since the housing bubble imploded has been with rental households. I know this is hard to believe for Taco Tuesday baby boomers but this is simply the new reality. And all of those investors that bought up single family homes for rentals are living it up. 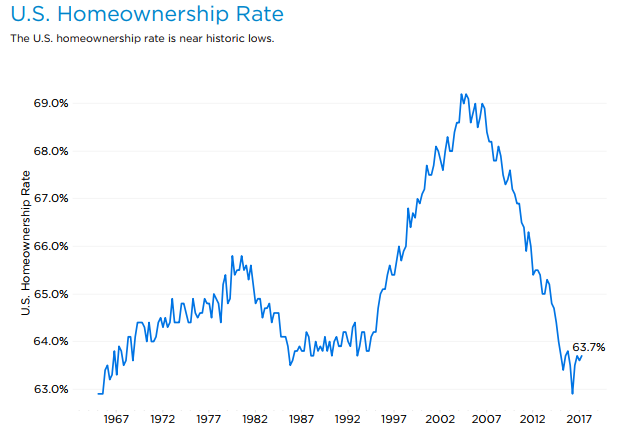 There are now a few major changes impacting the housing market – many more single family homes are rentals and many more renters are staying put. In other words, many are not looking to buy and builders realize this. 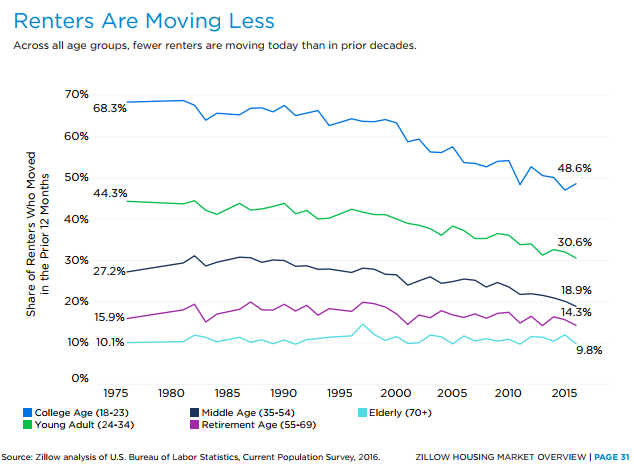 There is now a large category of permanent renters since many people live and work in more expensive metro markets. Short of forking out an insane amount of money to live in say San Francisco, people are opting to rent. The proof is in the numbers. Look at the chart above. This is an anomaly in terms of how many single family homes are out in the market as rentals. In terms of how many SFRs are rented as a percentage of the entire SFR pool, this is an increase of 50% from the 1980s. So what you have is a rental market that now has many more single family homes as rentals and many more renters are viewing these places as permanent versus transitory apartments. The fact that many more renters are staying put reflects this change. And why would a landlord argue with this? It is great to have long-term tenants. And for many, this meets their needs instead of buying an overpriced shack. 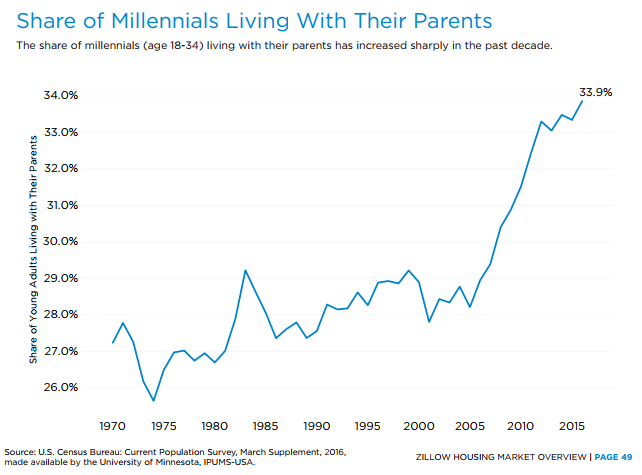 Inventory remains pathetically low and younger American adults in large numbers are simply staying put and living at home with mom and dad. This is not a typical housing recovery. This is a distorted market and this is the outcome of mapped out bailouts with the banks, hedge funds buying up single family homes, and builders becoming reluctant to build. People try to paint this recovery as a broad one but what this is highlighting is that this “recovery” is essentially jamming 100 hungry people into a restaurant and saying that the first 20 people that get to the counter will get a cold taco. Everything is relative and right now, that dump of a home with crappy construction and toxic mold is looking appealing at $1 million. Blaming a “severe lack of homes for sale and high demand,” the California Association of Realtors (CAR) claims in a report released last week that it now takes almost double the income to qualify to buy a home in California as it did in 2012. The situation is even worse in the Bay Area. CAR now recommends “a minimum annual income of $110,890” (before taxes) in order to purchase a single-family home in California selling for the median price of $533,260, based on a $2,770/month mortgage payment after 20 percent down and an interest rate of just over four percent. That is if buyers stick to the time-honored (but for many unreachable goal) of only paying 30 percent of monthly income to housing. In the Bay Area, the association recommends bringing in $179,390/year, which would come out to nearly $15,000/month. To put that amazing sum in perspective, computer programmers in the Bay Area are averaging only $106,710/year, according to the Occupational Employment and Wage Estimates from the Bureau of Labor Statistics from May 2016. Software developers are bringing in about $133,500/year. Cops somewhere around $105,540. And teachers $43,340. Even more startling, five years ago the recommended income was $90,370. A pretty heavy sum in and of itself—median income nationwide was just over $51,000 that year according the US census—but just about half what it takes today. These figure depend on CAR’s estimates about median housing prices, of course. The report pegs the average home in San Francisco at $1.45 million, for example. Earlier in the summer, Paragon Real Estate Group estimated the same price between $1.4 million and $1.5 million, depending on the month. Sites like Trulia and Redfin put it at $1.19 million and $2.24 million respectively, although those aren’t scientific samplings. The national housing inventory crunch is not expected to ease in the coming year, though more new homes should help spur a slight uptick in sales. In its 2018 Outlook, Freddie Mac projects 6.30 million home sales in 2018, up from an expected 6.18 million this year, which would be the most in a decade. That 2 percent increase will largely be driven by sales of new homes, as sales of existing homes are unlikely to grow due in part to aging-in-place trends. Freddie Mac expects home price growth to cool slightly next year, from a projected 6.3 percent in 2017 to 4.9 percent. Those projections line up almost exactly with the latest numbers from economists at John Burns Real Estate Consulting, which predicts 6.0 percent appreciation this year and 4.9 percent next year. Both Freddie Mac and JBREC also have identical projections as to where 30-year, fixed-rate mortgages will be by the end of 2018: 4.4 percent. Freddie Mac projects that rising interest rates will cause refinancing activity to decline to 25 percent of the market by next year, its lowest level since 1990. East Bay real estate markets have seen their fortunes rise during the current housing cycle, and now a dozen communities in Alameda and Contra Costa counties have median sales prices of more than $1 million. Citing data from Bay East Association of Realtors, The Mercury News reports that Alamo was the region’s most expensive market in August, with a median single-family home sales price of $1,665,000. The other cities in the two counties with $1 million-plus home prices: Orinda, Lafayette, Danville, Moraga, San Ramon, Walnut Creek, Berkeley, Albany, Fremont, Dublin, and Pleasanton. Inventory in the Alameda and Contra Costa counties continued to decline in August, and BEAR Spokesperson David Stark doesn’t see supply levels improving anytime soon. “With schools in session, there will be even fewer homes on the market,” he told the Mercury News. Buyers priced out of the East Bay’s more expensive enclaves might want to consider the Contra Costa County communities of San Pablo, Richmond, Pittsburg, and Antioch, all places where a single-family home can be had for less than $500,000. 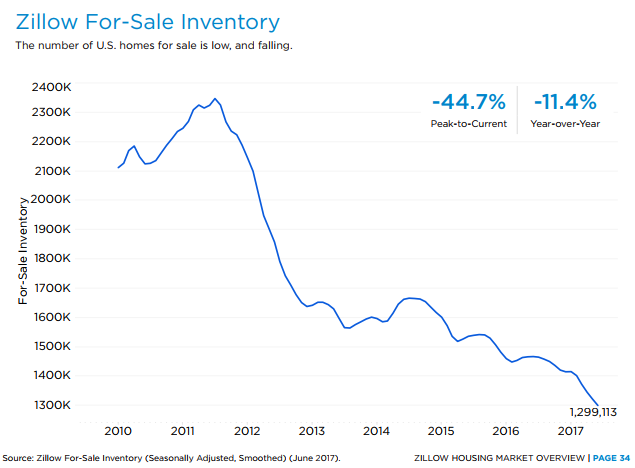 However, it appears the secret is out, as year-over-year inventory levels have shrunk in those four cities by between 24 percent and 48 percent. Foreclosure activity typically increases in August as the real estate market takes a breather, but this year’s jump was particularly large, with San Francisco posting one of the biggest gains in the U.S.
A new report from ATTOM Data Solutions says that there were 75,115 properties with foreclosure filings last month, a gain of 14 percent from July, the largest such increase in 10 years. Foreclosure activity in San Francisco spiked by 62 percent month over month, second only to Phoneix for the largest increase in the country. In a statement accompanying the report, company Senior Vice President Daren Blomquist noted that foreclosure filings are down on an annual basis and cautioned against reading too much into the monthly gain. “While this seasonal increase is certainly not enough to set off alarm bells nationwide, especially given that foreclosure activity was down annually for the 23rd consecutive month in August, there is cause for concern in a few local markets where foreclosure activity has consistently been trending higher on an annual basis this year,” he said. Mortgage rates have risen for the first time in seven weeks, and more increases are likely on their way later this year. Freddie Mac says that 30-year, fixed-rate mortgages averaged 3.83 percent for the week ended Sept. 21, up from 3.78 percent the previous week. Fifteen-year, fixed-rate mortgages also saw a 0.5 percent weekly increase, rising to 3.13 percent. While mortgage rates remain low by historic standards, the Federal Reserve signaled last week that it would raise interest rates one more time in 2017, most likely in December. CALIFORNIA, AUGUST 24, 2017 – The San Francisco Bay Area real estate market softened in July 2017 as single-family home and condominium sales fell a higher than expected 19.5 percent from June 2017. July 2017 home sales were down 5.6 percent from 2016 marking the lowest July sales volume since 2010. On a year ago basis, July 2017 median home prices were down in four of the nine Bay Area counties. The largest price declines were in Marin (-13.7 percent), San Francisco (-9.8 percent), San Mateo (-3.8 percent) and Santa Cruz (-0.9 percent). The biggest annual price increases were in the lower priced counties, Sonoma (9.1 percent), Solano (7.9 percent), Alameda (6.2 percent), Contra Costa (6.1 percent). Homeowners in zip codes with at least one good school gained an average of $74,716 in value since the purchase, an average return on investment of 32%. On the other hand, homeowners in zip codes without good schools gained an average of $23,311 in value since their purchase, an average return on investment of 27.5%. For families looking to rent, it is an entirely different story as some are being priced out of good school districts. Families looking to move this summer are taking a closer look at the quality of school districts. Rents in some cities are significantly higher in areas with the best-rated schools over areas with low-rated schools. Winter is Approaching, Is Your Home Ready? Autumn wind will be here any week now and they will blow a chilly reminder that winter is fast approaching. Perform the following maintenance tips each fall to protect your property's value and prevent major repairs. Upside Down on a San Jose Home? HARP can help you refinance.